Healthy start: Year 10 San Sisto College student Olivia Joyce, Lourdes Hill College student Georgia Press, and Somerville House student Jane Nimmo have devised the Healthy Body Healthy Mind initiative, aimed at offering 12-17 year olds a range of free outdoor fitness activities. THREE savvy schoolgirls have devised a fun fitness program to get Brisbane teenagers into shape this September holiday break. 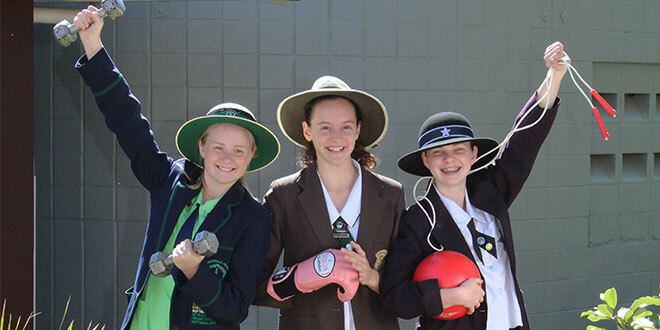 Year 10 San Sisto College student Olivia Joyce, Lourdes Hill College student Georgia Press, and Somerville House student Jane Nimmo have devised the Healthy Body Healthy Mind initiative, aimed at offering 12-17 year olds a range of free outdoor fitness activities. The initiative has been developed as part of the girls’ involvement in the 2016 Lord Mayor’s Youth Advisory Council. “We noticed that there was a lack of fitness activities in our local parks for teenagers,” Olivia said. The Healthy Body Healthy Mind initiative is funded by Brisbane City Council and aims to increase young people’s awareness around the benefit of healthy lifestyle activities. Young people can participate in a range of sessions, including Zumba, boxing, yoga and circuit training. Sessions will be held in parks across Brisbane, including Majestic Park, Coorparoo; Bulimba Memorial Park; Bayside Park, Manly and New Farm Park. The full schedule is available on the Brisbane City Council website.